The presence of marker genes conferring antibiotic resistance in transgenic plants represents a serious obstacle for their public acceptance and future commercialization. In addition, their elimination may allow gene stacking by the same selection strategy. In apricot, selection using the selectable marker gene nptII, that confers resistance to aminoglycoside antibiotics, is relatively effective. An attractive alternative is offered by the MAT system (multi-auto-transformation), which combines the ipt gene for positive selection with the recombinase system R/RS for removal of marker genes from transgenic cells after transformation. Transformation with an MAT vector has been attempted in the apricot cultivar ‘Helena’. 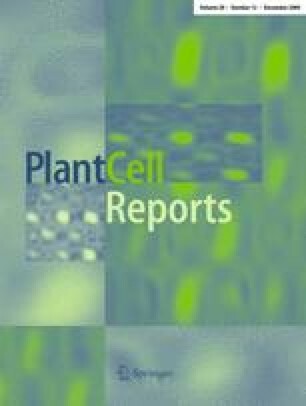 Regeneration from infected leaves with Agrobacterium harboring a plasmid containing the ipt gene was significantly higher than that from non-transformed controls in a non-selective medium. In addition, transformation efficiencies were much higher than those previously reported using antibiotic selection, probably due to the integration of the regeneration-promoting ipt gene. However, the lack of an ipt expression-induced differential phenotype in apricot made difficult in detecting the marker genes excision and plants had to be evaluated at different times. PCR analysis showed that cassette excision start occurring after 6 months approximately and 1 year in culture was necessary for complete elimination of the cassette in all the transgenic lines. Excision was confirmed by Southern blot analysis. We report here for the first time in a temperate fruit tree that the MAT vector system improves regeneration and transformation efficiency and would allow complete elimination of marker genes from transgenic apricot plants by site-specific recombination. This work was supported by CICYT AGL2006-01743/AGR. Dr. César Petri is supported by a post-doctoral JAE contract from the CSIC and Dr. Sonia López Noguera by a fellowship from Fundación Séneca. We are deeply grateful to Dr. Nuria Alburquerque for critical review of the manuscript and Ma Dolores Nortes for technical assistance.